November 5, 2008 By Tony Albaceli & filed under All Articles, Handguns, Other, Rifles & Carbines, Weapons. Due to the steep rising costs of—well, everything—many shooters have been forced to invent new ways to come up with more money for fuel and ammunition or cut back on their training. For some, neither of these options is viable. Luckily there is a secret, third option. OK, it’s not really much of a secret. Ask the old-timers who have been shooting longer than you have been alive what they practiced with as a kid and what they still practice with now, and they’ll tell you the .22 Long Rifle (LR). The little rimfire is an inexpensive way to emphasize the basic and fundamental principles of shooting, thousands of times over. Today, there are many great ways to incorporate .22 LR into your training. This article reviews several different conversion kits available today, to allow you to get more range time for less cost. If your weapon of choice isn’t covered and a thorough search of the Internet and your local gun shop turns up empty, send a friendly e-mail to your favorite manufacturer. If there’s a market for it, they’ll build it. 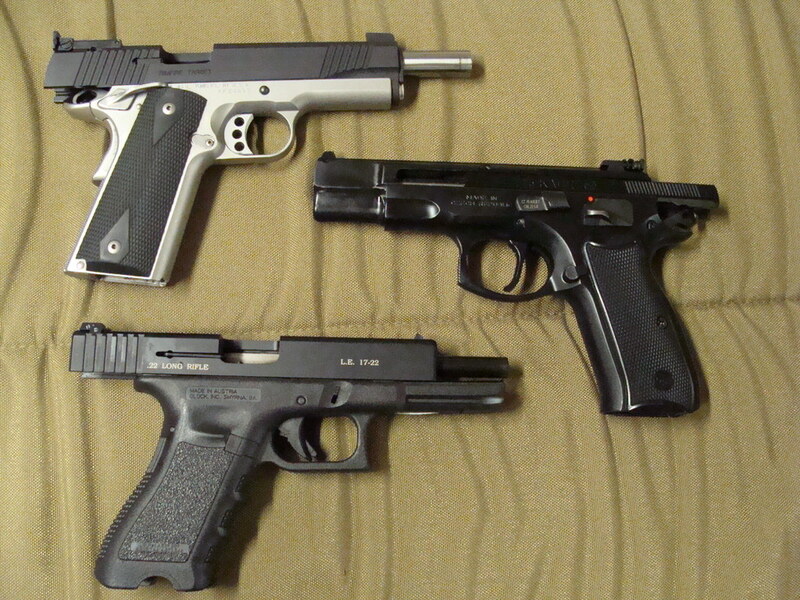 Pistols fitted with their .22 LR adapters (top to bottom): Kimber 1911, CZ Kadet and Advantage Arms Glock. This is the simplest .22 LR conversion that I’ve seen yet. Simply remove the bolt carrier from your AR, replace it with the Ciener adapter, and you’re done. The magazines that come with the kit work reliably, but I highly suggest the after-market magazines by BDM (Black Dog Machine). The BDM mags are very close to the same size and shape as standard AR mags, meaning they’ll work with most retention devices. Unfortunately, your bolt will not hold open with a Ciener adapter in place. Initially I had feeding problems with my Ciener conversion kit. I quickly discovered that it did not like Remington Golden brand plated bullets in bulk packaging. I have since tried various types of CCI and Federal ammunition, and even Remington Thunderbolts, and they’ve all worked flawlessly. I suspect the plating on the Remington Golden Bullets is what caused the feeding problems. Stay away from plated ammunition, and you should be problem free. Do not expect your AR to be as accurate as your dedicated .22 LR varmint exterminator; the barrel on your average AR is not the best choice for .22 LR. Consider that the rifling on your average AR is 1:9, but the ideal twist for .22 LR is somewhere around 1:12. Expect around five-inch groups at 50 yards, which isn’t as accurate as your .22, but should be plenty fine for training at 100 yards or less. 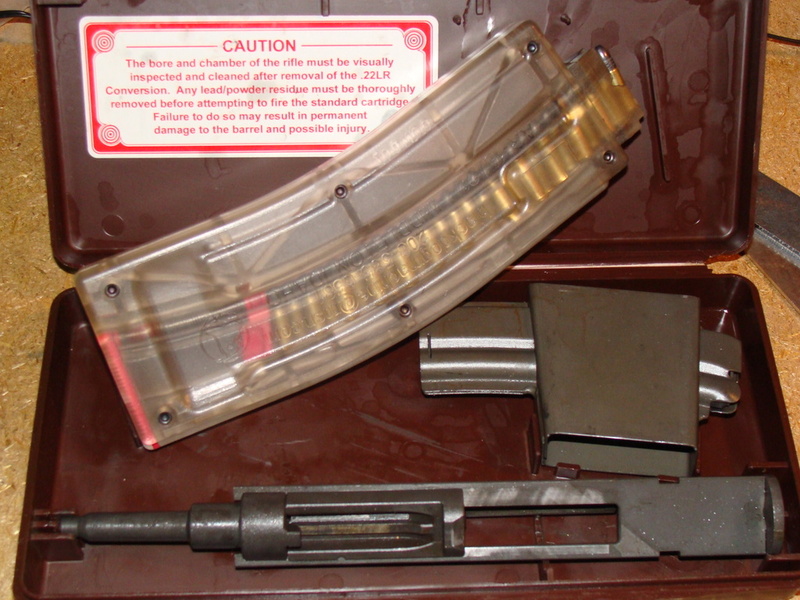 5.56mm caliber Magpul magazine next to .22 LR Black Dog Machine magazine. 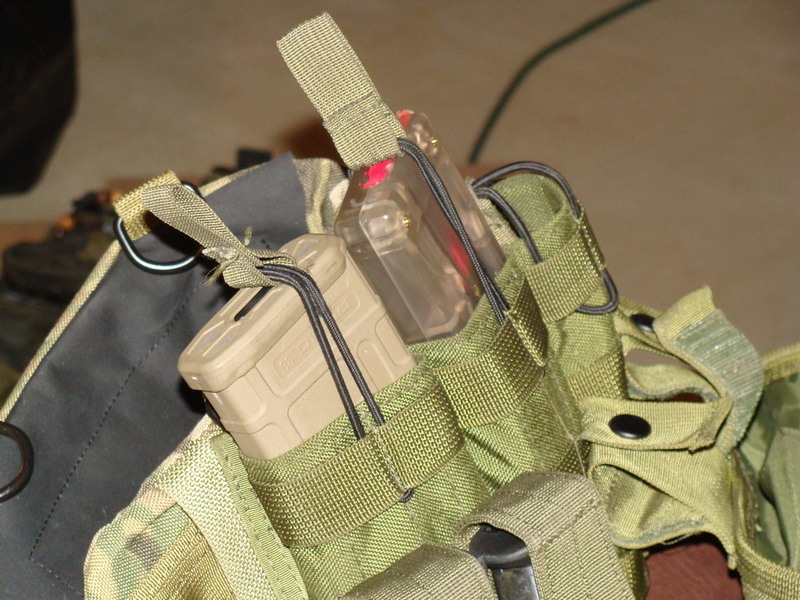 Both are approximately same size and fit in this Tactical Tailor 3-mag panel. After you have a session with the Ciener adapter installed in your AR, the manufacturer recommends you replace the original bolt and shoot regular ammunition to clear the gas line. It only makes sense to wrap up a training session with full-powered ammunition anyway. Everything you did with the Ciener adapter, do it again with 5.56mm. Now think of a 2,000 round training session. At today’s prices, $450 for a 1,000-round case of quality 5.56mm is not unheard of, and it’s only going to go up. Compare that to shooting 1,500 rounds with .22 LR at $15 per thousand and following that up with 500 rounds of 5.56mm. You just saved $630. I did have one problem with the adapter. After a recent range session, I dropped it to the ground, and the tip of the chamber adapter was crushed. Obviously it’s not the manufacturer’s fault that I dropped the rifle, and the chamber adapter does remove very easily for replacement. However, I am disappointed that the device is so fragile and that I had to shell out $35 again for the part. But when I think of all the money I’ve saved so far, I don’t mind as much. Still, it’s worth noting: the Ciener adapter is not a tool for combat. It is not accurate enough, durable enough, nor does the .22 LR provide enough power to reliably kill anything bigger than a rabbit. That said, I give the Ciener adapter high marks for its ability to easily change your regular AR into a .22 LR training rifle. Ciener .22 LR adapter and metal magazine that comes with it, shown with transparent plastic magazine by Black Dog Machine. Due to the popularity of the Glock, it made good sense to include Advantage Arms’ .22 LR Glock adapter. 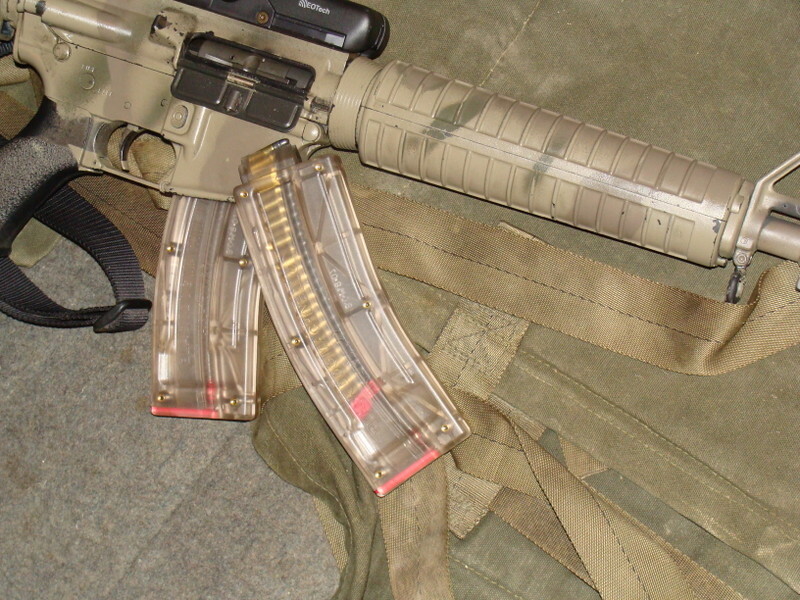 The original slide is replaced with the Advantage Arms slide, which is made from aluminum, and noticeably lighter. The slide on the model I tested was also a bit wider—presumably to get the correct weight for proper function of the pistol while shooting .22 LR—making some tight-fitting holsters like the Safariland 6004 unusable. The sights on the Advantage Arms adapter are indistinguishable from the OEM, and the pistol showed great accuracy. Operation was flawless with a couple of different types of ammunition. In fact, the slide lock functioned just as it normally would. While I am not a big fan of the Glock, I have to admit this is a very well-built adapter, and I highly recommend it for all Glockophiles. Ciener .22LR adapter was used to slowly introduce this new shooter to the AR before stepping up to full power ammunition. Just as the Advantage Arms Glock adapter’s slide is aluminum, so is the Kimber 1911 adapter, and replacing the original is all you have to do. With this product—like the Advantage Arms adapter—the significant weight reduction provided by the aluminum is essential for proper operation but takes a little getting used to. However, unlike the Glock adapter, Kimber’s is no different in size, so all holsters should work fine. Accuracy with the Kimber adapter was good, but it was a little finicky. I was using CCI ammunition without a problem, but switching to Winchester SuperX caused some malfunctions (Note: Kimber recommends Winchester Wildcat.). The slide lock on the Kimber adapter does not operate, which is disappointing, but consider how difficult it must be to engineer something like that when it’s obviously an afterthought. The 1911 is an American legend. However, so many different companies have adopted its design that I doubt there is a single .22 LR adapter that will function with all makes and models. That said, the Kimber 1911 adapter is made for Kimber 1911s only and should not be tried on any other style 1911. CZ Kadet .22LR adapter. Note only a portion of the slide reciprocates. Essentially, the goal here is to replace the original slide with the adapter, just like in the previous two pistols. However, CZ’s adapter slide is actually two components: one reciprocating, the other not. Recall that the other pistol slides were made of aluminum in order to achieve the correct weight to function properly. CZ was able to maintain roughly the same weight as the original design by making the replacement slide from two separate components and having only one of them cycle. In this way, the energy from the .22 LR only pushes a a portion of the slide that has the correct weight for proper function. As it turned out, the fitting wasn’t nearly as complicated as I had feared. 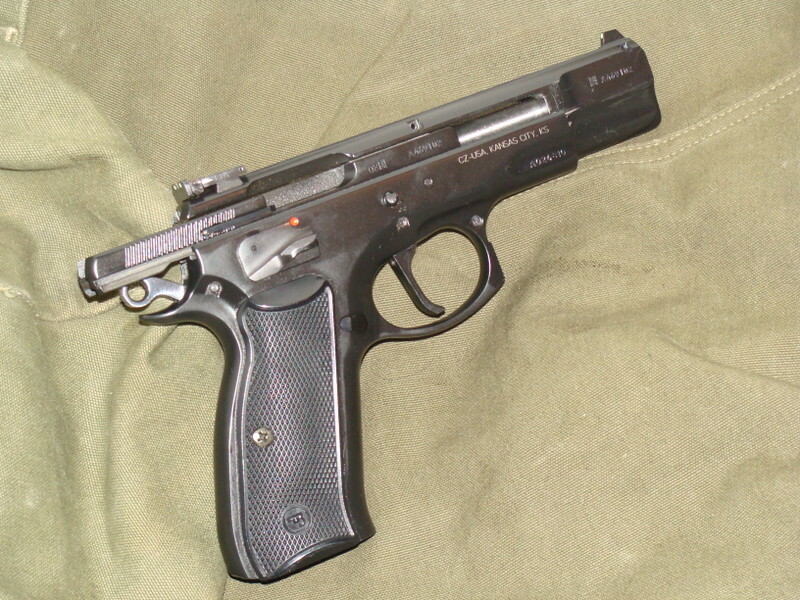 CZ recommends a gunsmith, but (keep this between you and me) I fitted the slide myself. The instructions provided are pretty clear, and even if they weren’t, it is readily apparent what needs to be done by simply looking at how the slide and frame mate together. Total time to fit the Kadet: 30 minutes. The Kadet shot flawlessly and with great accuracy. What’s more, the slide lock worked normally. AR fitted with the Ciener .22LR adapter with Black Dog after market magazines. There may never be a perfect .22 LR adapter for any weapon system. 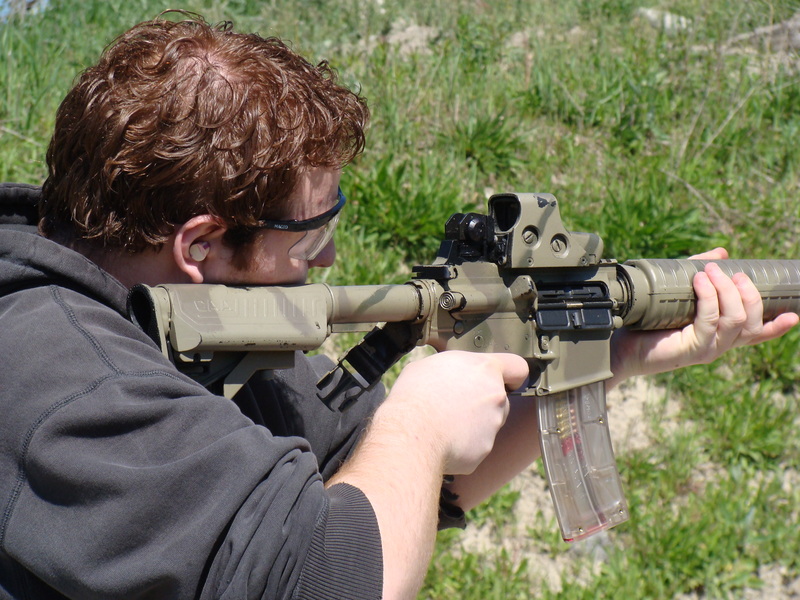 Some feel or operate differently, and all certainly have less recoil than their originally designed configuration. While you are debating whether or not you feel it is a good idea to incorporate .22 LR training as a supplement to your normal regimen, just remember: if it is a choice between training with a .22 LR and not training at all, always choose the former over the latter. In any case, like it or not, there is likely to be more .22 LR in your future. The economic conditions that we’re experiencing now are not going away any time soon. If you can afford to train with regular powered ammunition, great! You should definitely stick with full strength ammo if you can, but that’s increasingly difficult for a lot of folks. Look for more manufacturers to develop their own .22 LR adapters, and more entrepreneurs developing adapters where manufacturers can’t or won’t. As the demand for these products increases, the adapters will evolve and improve, becoming ever more like the original weapons they are designed to imitate.